The RS232 standard describes the communication between DTE, data terminal equipment (computers, printers, etc.) and DCE, data communication equipment (modems). For those situations where two DTE devices must be connected directly, null modem cables can be used. However, for some types of communications standard symmetrical null modem cables are not the appropriate solution. One of these situations is the connection of a serial printer with a computer. Although the serial connection is two-way, data is only sent from the computer to the printer. It wouldn't surprise me if most serial printers work without problems if the Tx line of the printer is not connected to the Rx of the computer at all. The main problem of this asymmetric use of RS232 communications is that the handshaking is also not symmetric. There is no need for the computer to send handshaking signals to the printer. The printer however has many situations which need handshaking to stop the computer for sending data. Think of out of paper, off line or formfeed situations. Also older serial connected printers often use a mechanical printing method like dot matrix or daisywheel which speed is limited by the mechanical construction. Besides this some printer manufactures decided to use pins not normally used on RS232 interfaces to make the situation even more confusing. The wiring diagrams on this page won't fit to all situations, but you will get your printer connected in at least 95% of the cases. Alternatively you might try one of the null modem cables. 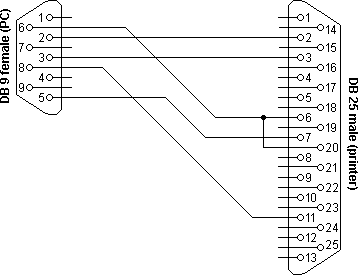 There are cases where disabling all hardware flow control and switching to a simple null modem cable with XON/XOFF handshaking is the only method to succesfully connect a serial printer to a computer. 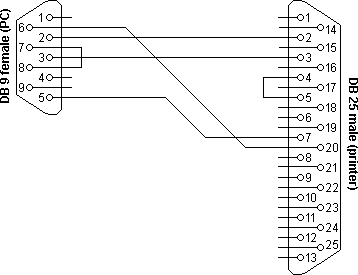 When a serial printer is connected to a PC with an RS232 cable, the handshaking is not symmetrical any more. In that case an RS232 cable is used where some handshaking lines at the PC side are looped back. On the printer side only the data lines and one handshaking line are used. The printer doens't send large amounts of data to the attached computer, so there is no need to use handshaking lines on the printer to control the data flow. The only RS232 signal used in this cable is the DTR signal which is used by the printer to inform the computer about error situations like out of paper etc. This cable should work with most serial printers. Fujitsu recommends a different cable wiring diagram to connect printers from this manufacturer to computers. In this situation the DTR of the printer is send back to the DSR input of the computer. The other handshaking signals RTS and CTS are looped back on both sides. Really strange is the serial printer cable wiring diagram for the Texas Instruments 800 and OKIData MicroLine 80 and 90 series printers. These printers use the SRTS, secondary request to send line at pin 11 to connect to the CTS of the computer. 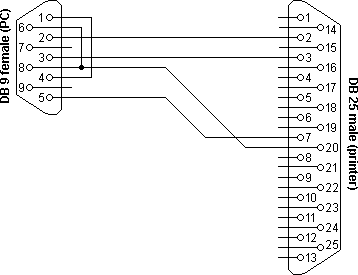 Pin 11 is unused on almost all serial ports so it will be difficult to find the right cable at your computer store. The diagram can be helpful to modify or build your own cable to connect these printers to your computer. you're in the wrong lane.